My first experience with Key Lime Pie was the happiest time of my life...or was it just at the happiest place on Earth? I remember I was in Epcot Center at the Walt Disney World Resort in Florida, eating a big lunch with my family that, now looking back on it, probably cost more than my entrance pass. After finishing that meal and declaring I couldn't possibly eat one more bite, my mom graciously suggested I get some Key Lime Pie for dessert. And though I wasn't quite sure if I'd get it down, I once again fell victim to my weakness of saying "no" to free food. Now I don't know if it was because some pixie dust had found its way into this particular piece of pie, or because we were in Florida, home of Key West and key limes, but when I took my first bite, I was in heaven! I had never tasted anything so light and delicious. It was like I was eating nothing at all, and yet my taste buds were singing the "Hallelujah Chorus." From then on, I was hooked. Apparently everyone else was too because it seemed like my grandma started bringing her own Key Lime Pies to a lot more Sunday Dinners. They were never quite like that first one, but they were the next best thing. In fact, her Key Lime Pie recipe became the new standard. If it wasn't Disney's, then it better be Grandma North's. Place milk, cream cheese and lim juice in blender or food processor. Process on low speed until smooth. Add vanilla. Pour into graham cracker crust. Chill in frig until set 3-4 hours. Top with whipped cream. 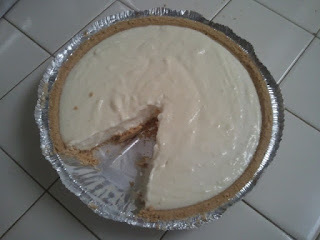 When I recently got a hold of Grandma's recipe, I was surprised by its title, "Bemini Key Lime Pie." I decided to figure out what it means and where the recipe originally came from. As it turns out, "Bemini" is not a word. The Bimini Islands, however, are located in the Bahamas and are famous for...you guessed it: Key Lime Pie. Despite the unfortunate typo, I have not changed the way I feel about this family tradition. In fact, I've decided to keep "Bemini" as a hallmark of the recipe's origins. You see, I'm afraid there's much more Bemini in this Key Lime Pie than Bimini. Sweetened condensed milk, cream cheese, and a graham cracker crust are not exactly the most exotic ingredients, but what it lacks in native authenticity is made up in just plain deliciousness. This pie, unlike it's Epcot predecessor, does not feel like you're eating nothing. It's creamy like a cheesecake and tangy like a key lime. It's also cold and refreshing, and most importantly, doesn't require you to use the oven on a hot day. So give Grandma's Bemini Key Lime Pie a try. It may just turn out to be the family vacation you've been missing.